I feel fortunate to have the opportunity to talk to a number of executives from a wide range of companies about their business and IT strategies. Every executive and company has their own unique set of challenges, but they all share the need to equip their staff with the skills that will help them move toward their future aspirations. This is no different when it comes to the cloud. While this may seem obvious, several executives have told me that the perceived lack of cloud skills in their organization is the primary reason they haven’t made as much progress as they’d like on their Journey to the cloud. Educating your staff is the second of seven best practices I’ve observed enterprises with successful cloud strategies follow. Providing executive leadership is the first, and I’ll explore the others in subsequent posts. Educating your staff can turn skeptical employees into true believers and will make a huge difference in how quickly you’re able to leverage the cloud to deliver results to your business. People fear the unknown, and change makes some uncomfortable. One the most powerful things you can do to alleviate that fear is to educate. You may also look to acquire new talent that already has the skills you’re looking for, but this typically only works in small doses and can be difficult to scale. Most organizations already have a wealth of institutional knowledge and cultural practices that are well established in tenured staff members. This can be used to the organization’s advantage if the existing staff is given an opportunity to learn how to marry institutional knowledge and culture with cloud technologies. In other words, everyone you need to move forward with the cloud is already there, you just have to enable them. The following points illustrate some of the areas I suggest executives consider when educating their staffs on cloud technologies. I typically try to focus my posts on strategic and leadership guidance void of any AWS-specific services or solutions, but I couldn’t avoid pointing to some of the AWS programs that suit this topic so well. I’m sure you can think of others, and I’d love to hear about them! AWS’s self-directed and instructor-led training courses can help your team get started quickly and keep skills current over time. I won’t repeat the details that are very eloquently provided on the website, but I will say that every company I’ve talked to that’s using our training programs now benefits from better cloud operations. Most report the reduction of friction between teams within their organizations, too. When I was at Dow Jones, we trained nearly every technical person on our team with what became the AWS Technical Fundamentals course. Over time, many of the individuals interested in meaningful adoption took more advanced courses, too. We eventually institutionalized training of our own. Our DevOps team started to host “DevOps Days” where others in the organization learned about the best practices, frameworks, and governance models we developed on top of the cloud. This type of grassroots education made a meaningful impact on how people worked, and helped us reinforce elements of the culture we were trying to build in the context of a cloud-first tomorrow. The training grew to be one of the most effective mechanisms we had for knocking down internal roadblocks. It became very difficult, for example, to attend a DevOps Day and not become enamored with what we were doing with the cloud. I’ve since talked to several other large companies taking a similar path. They’re working with the AWS training and certification team to create and scale large training programs that suit their own specific organization’s needs. If you still feel like your staff is resisting, it may be worth sharing this chart that illustrates job trends from indeed.com. 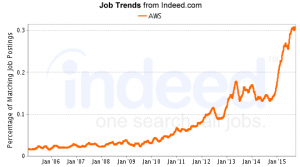 There is a clear and steep rise in demand for cloud skills, and I don’t see this trend changing any time soon. I think it’s pretty safe to say that cloud training is something that will will pay dividends for you and for your employees for many years to come. You may be leading your organization’s cloud Journey, but you don’t have to do it alone, especially when it comes to education. Talk to your peers, attend cloud-related events, and read about what other companies are doing. It’s amazing how fast the cloud ecosystem has grown, and how many born-in-the-cloud businesses have found success in such a short amount of time. There’s a wealth of information online illustrating what many companies have accomplished, and how you can leverage what they’ve learned. The AWS Partner Network is one way to browse the ecosystem, and is full of resources that you can learn from. Whether you’re looking for a tool to help you with a specific need or an implementation partner to help you with a large migration, there’s a wide variety of partners to choose from. You can always look to your AWS account manager to help you find the right one. I’ll dive deeper into the partner community in an upcoming post. Last but not least, AWS Professional Services has helped hundreds of executives identify the roles and skills needed to execute a cloud strategy. The AWS Professional Services team does this by assessing an organization’s current readiness and helping the organization obtain the skills they need based on AWS Professional Services’ experience helping hundreds of similar companies. Through these engagements, AWS Professional Services has developed the AWS Cloud Adoption Framework, which they’ve made freely available for any organization who’d like to use it as a resource as they transform their organization toward a cloud operating model. I’ve yet to come across a use case where someone with the appropriate skills and a can-do attitude couldn’t find a place for themselves in the cloud. While I think most people can imagine that anything’s possible, it can be harder for those who don’t have the experience to prove it. Training is a great way to expose everyone to new concepts and illustrate examples, but I’ve always felt the best education comes in the form of experience. Give your teams a hands-on, time-constrained opportunity to do something meaningful to your business with the cloud, and see what happens. Ask them to build a website, create an API for some of your data, host a wiki, or build something else tangible that fits into what your teams already do. I’m always surprised by how quickly the right motivation mixed with a bit of time pressure can lead to results. Scarcity breeds invention, and I’ve seen some pretty innovative things happen in a short amount of time when the goals are clear and the tools are predetermined. These hands-on experiences might become game-changing innovations, or they may simply provide some education that you parlay into your next project. Either way, they’ll help you move your agenda forward, and give your team a great opportunity to learn. Note: Educating your staff is the second of seven best practices I’m writing about in my new Enterprise Cloud Journey series. The remaining six are: executive support, create a culture of experimentation, engage partners, create a center of excellence, implement a hybrid architecture, and implement a cloud-first policy. Stay tuned for more on each of these.